There is a reason they’re not called the one-step or the two-step, but The Twelve Steps. When you are ready to admit you’re powerless in changing or controlling another person’s addictive disease, Step 1 is the place to start. 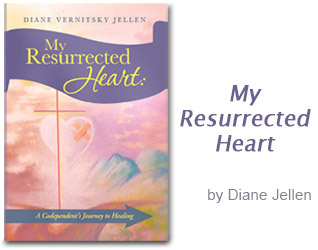 That’s where author Diane Vernitsky Jellen’s award-winning book, My Resurrected Heart: A Codependent’s Journey to Healing began. In order to remain healthy Jellen knew she couldn’t stop at the first step. 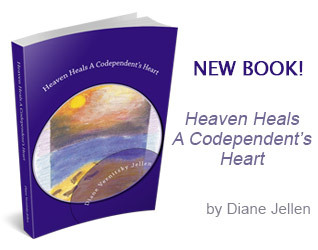 Diane continued following the steps and in her second book, Heaven Heals a Codependent’s Heart she introduces new friends and reveals circumstances that propelled her path to recovery. From an unmanageable life to admitting the exact nature of her wrongs, Jellen took one-step at a time. In a series of vignettes, Jellen shares insights she gained from making amends, and the principles she gleaned from the travelers she met along the way. From a marital breakup to a car breakdown and the Jersey Girls she encountered on the Pennsylvania Turnpike. Diane’s admission to a hospital began with a stomach bleed, but after a self-diagnosis, she discovered her lack of compassion toward another patience was far more debilitating. A mid-air blown engine flight brought Diane face-to-face with a young man who was not ready to take the first step but it reinforced her decision to turn her will and life over to the care of God, as she understood Him. Instead of seeing each setback as a failure, Jellen experienced a deeper conscious contact with the God of her understanding, her Higher Power, her Father God. Make a fearless and searching inventory and discover you like who you have become. Challenge codependent martyrdom that keeps you locked in a victim mode. Set boundaries by not seeing everyone you meet as a person you must fix. Recognize your strength, know when to share your recovery, and move on before you fall victim—again. Whether others accept your new attitude is not for you to control. Diagnose character defects that threaten your day-to-day growth. Find an awareness in each step of your discovery of self. Freedom from any addiction means challenging deep-seeded beliefs. Recovery from codependency means working to change patterns that will restore us to sanity. Face it, trying to control others when we can’t even monitor our own behavior is a codependent’s trip with insanity. And that, my dear enabling friends, is a trip we do not have to take. This forty-day devotional memoir details Jellen’s slow but progressive recovery from crippling codependent behavior to self-respect. Follow Diane on her healing journey and learn how you, too, can face your fears and overcome your shortcomings. Along the way, you will discover that it’s okay to love and respect the person God designed you to be. Along with her book, Diane also writes for, The Sober World, an award winning national magazine dedicated to helping families who have loved ones struggling with the disease of addiction and co-addiction. Click here to read Diane’s latest article in The Sober World Magazine.